RHINO™ IIS 410 is the most powerful in-line flat bed embosser in the market. 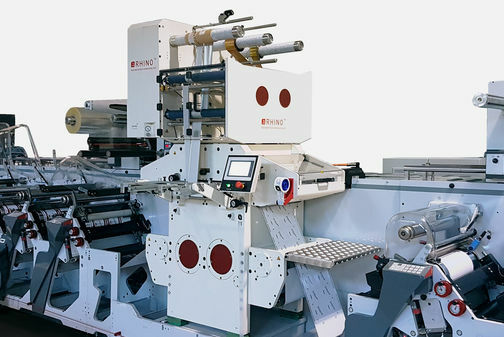 The system is the answer to an increasing demand for higher numbers of foil decoration features for high end labels. RHINO™ II is operating on a speed of up to 30’000 cycles per hour for multi-stepping designs. These 8,3 strokes per second allow production at high speed with cost effective tools. A 2-step design, for example, runs up to 100 m/min and 3-step design up to 68 m/min. RHINO™ IIS also accommodates one or two foil stepping servo levels for independent patterns and operates with a stamping pressure of up to 60 tons. 6 individually controllable heating zones for maximum flexibility in heat management on demanding multi-step designs complete the unique functionality.